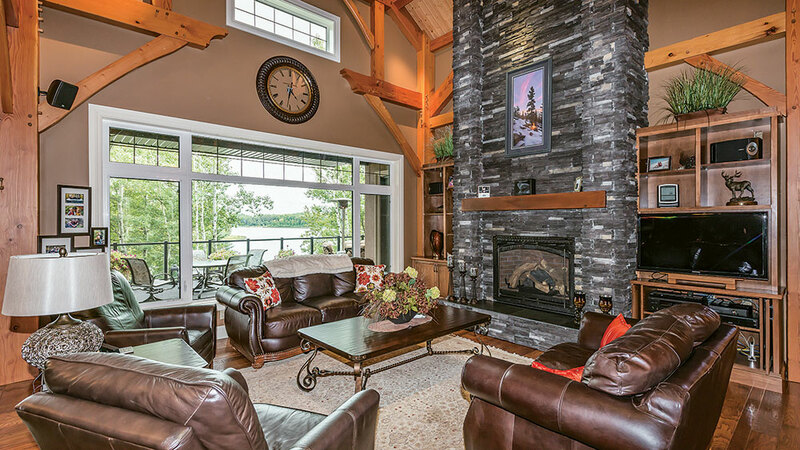 A cherished lakeside lot that was the site of many long-held memories now serves as a fresh start for a Canadian family and their new timber frame home. 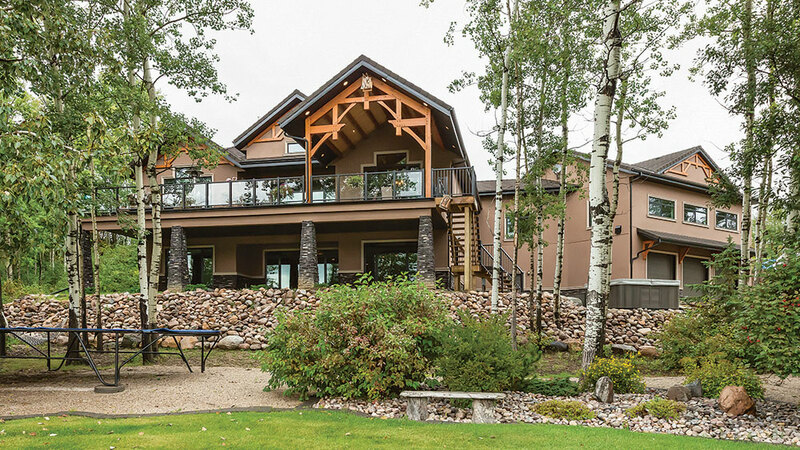 The owners of The Jackfish Lake Retreat have enjoyed their lakefront lot for years — long before this charming bungalow graced its grounds. Originally, the family owned a 600-square-foot cottage on this property, and they were very attached to all the memories they’d made here. The loss of their grown son to meningitis was a somber reminder that capturing every moment was of utmost importance. So they decided that one of the best things they could do was have a larger place where they could all be together at the lakefront lot they loved. It was a case of right location, wrong house. 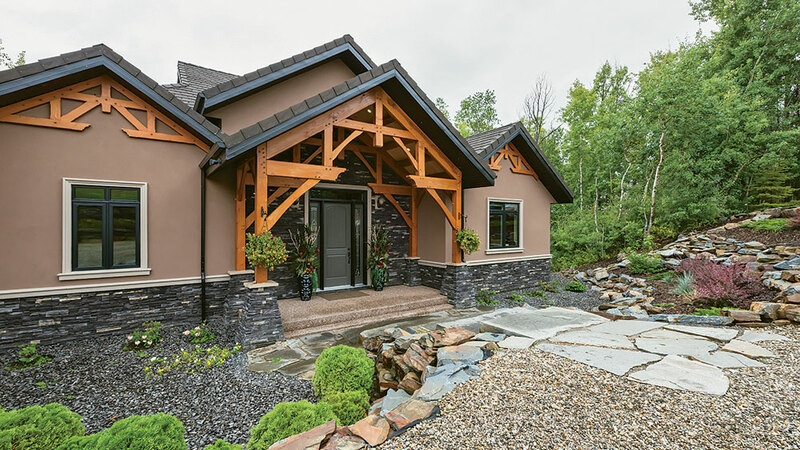 The couple sold and removed the tiny cabin from the lot, essentially leaving a blank slate to design and build this brand new 2,245-square-foot timber frame bungalow, with the help of Mira Timber Frame in Alberta, Canada. The lot was a bit of a challenge, as there’s a 35-foot drop from the front to the back. But in the end, it gave the design/build team a unique opportunity to build a “garage under the garage” for added storage. Inside, Trudy concentrated on securing a direct line of sight from almost every room in the house, resulting in an inside/outside connection throughout. “It was designed around the front door, the staircase and the view beyond. We were very strategic about planning the other rooms around this foyer and center line,” Trudy says. 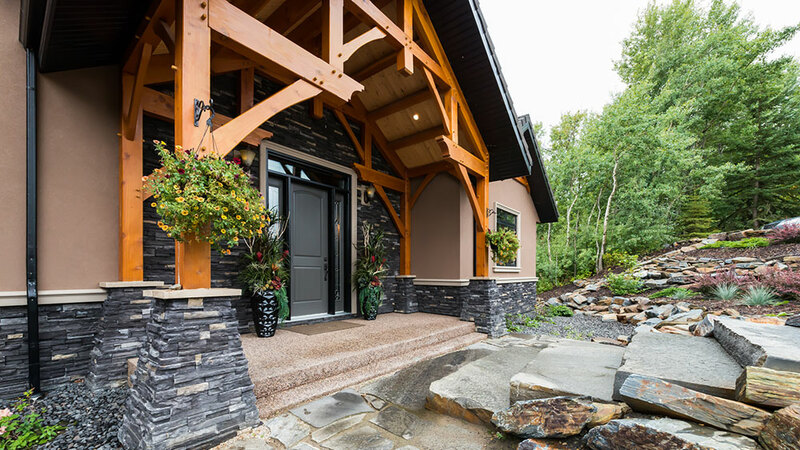 “When you walk through the front door, it was all about having a direct line to the lake. Everything else is peeled to the side … the fireplace, the kitchen … the focus is on the water view and the open timber structure. 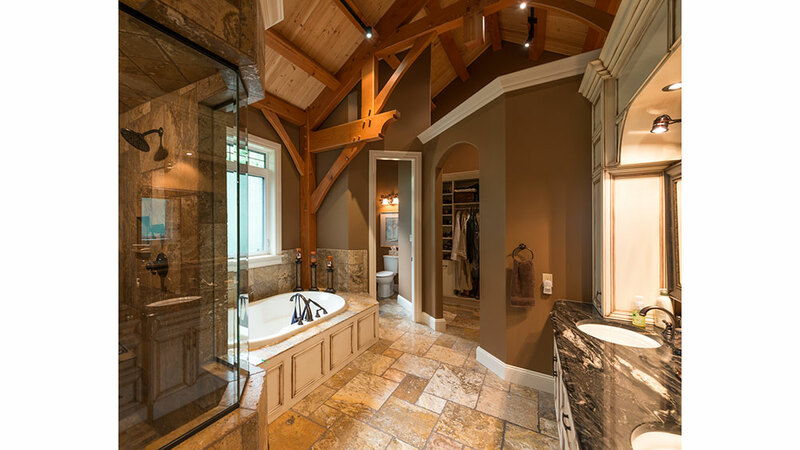 To achieve this, it took multiple floor plan renditions to get the right traffic flow and privacy levels. 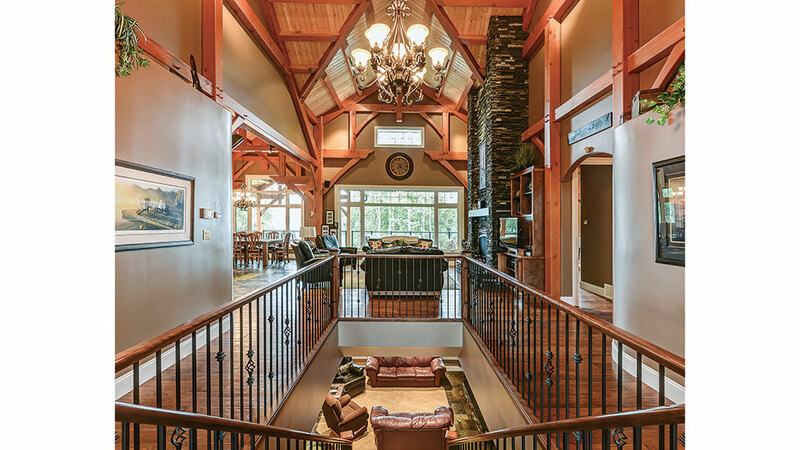 “With timber framing, we can do some big spans across and get some open, dramatic roof lines, but this plan took some maneuvering. It didn’t happen overnight,” Trudy says with a laugh. Not only do the owners love to surround themselves with family, they are part of a dinner club, so they entertain a lot. “They’re cooking all the time,” says Trudy. For this reason, the outdoor living space was just as important as the inside. The covered deck boasts a dining area and outdoor kitchen. “We can get some beautiful winter days, where it’s nice to be outside, but you need protection from the wind. Covered decks give that extension of the living space and connection to the outdoors,” Trudy says. 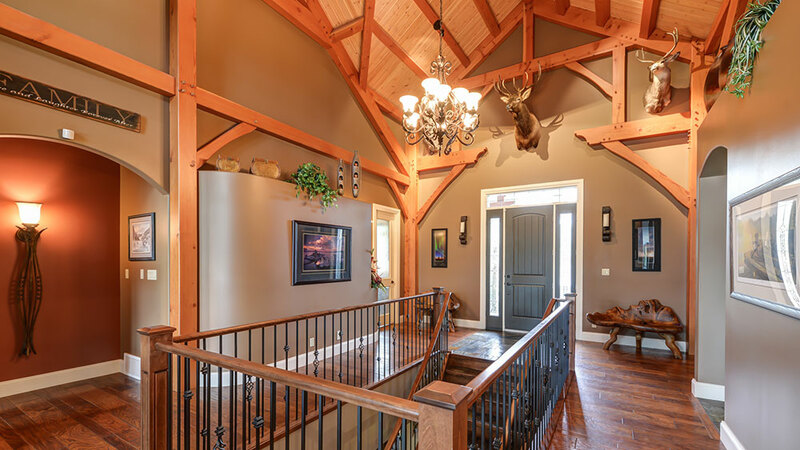 The frame is a hammer beam truss system fabricated from Douglas fir finished in an oil-based stain that has just the slightest pigment, allowing the rosy undertones of the fir to come through. The pine tongue-and-groove ceiling has a blond hue, so there’s rich contrast between the wood species. But it’s the memories that remain, and the new ones that are made every day, that give this charming home its true beauty. 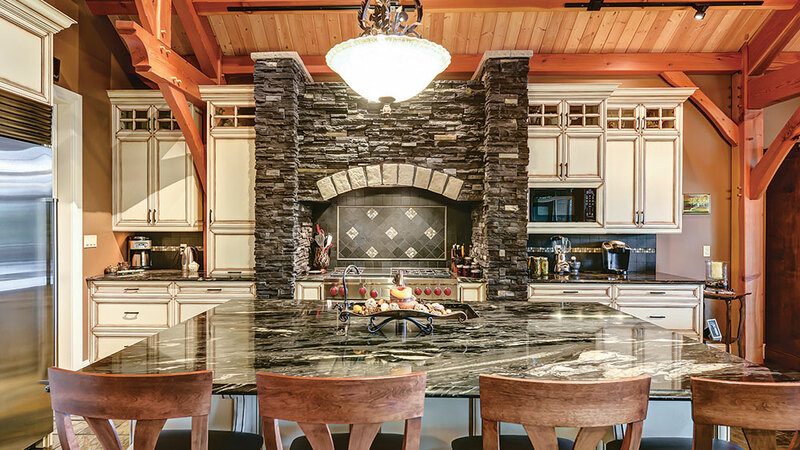 Combining kitchen cabinetry and timber frame braces can sometimes present a challenge. In this kitchen, the frame became an architectural focal point. An oversized pantry (not shown) allowed the owners to reduce the kitchen’s footprint, saving money on unnecessary cabinets. “The windows have a little wider casing than usual. It’s these kind of details that make a difference on a home,” design manager Trudy Gauthier explains. 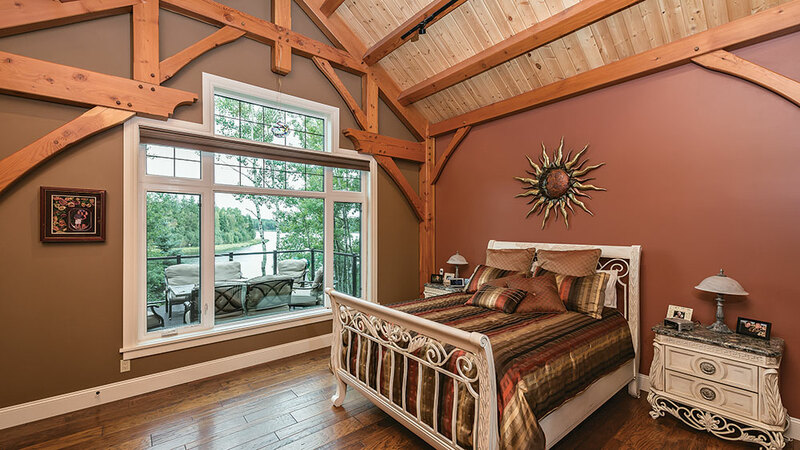 The hammer beam trusses found throughout the frame give a feeling of stepping up toward the vault in the ceiling, allowing the house to feel more like the bungalow it is.